Sri Lanka’s Export Development Board, better known as EDB, released the country’s National Export Strategy, dubbed as NES, last week after conducting a series of national consultations for over a year with main stakeholders. It is a late product, coming out after three-and-a-half years since the present good governance Government came to power in January 2015. It is also late by two-and-a-half years, since Prime Minister Ranil Wickremesinghe outlined his export strategy in the first Economic Policy Statement or EPS presented to Parliament in November 2015. Emphasising the need for building an exports-based economy, the Prime Minister declared in his first EPS that Sri Lanka should produce for a market bigger than its limited domestic market. This has been Sri Lanka’s economic growth strategy throughout its history: ‘Produce not only for yourself, but also for the rest of the world’. Accordingly, in the distant past, Sri Lanka had produced elephants, ivory, timber, ships, spices, pearls and gems, not only for its own use, but also for selling to people outside its shores through merchants who had visited it from almost all over the world. This practice had been followed more vigorously during the colonial period spanning for over 500 years to date. In the British period, more export commodities like tea, rubber and coconut were added to the list. 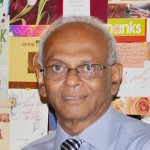 Thus, Sri Lanka’s economic growth in the late British period mainly came from international trade, according to the top economist and former Central Bank Governor, the late Dr Warnasena Rasaputra, who submitted a doctoral thesis under the title ‘Influence of Foreign Trade on the Level and Growth of National Income in Ceylon’ during 1926 to 1957 to USA’s University of Wisconsin. Since export duties were the main income source of British rulers, Colonial Ceylon was able to establish universal free education and healthcare services, build a railway system and construct major irrigation projects out of the income which the Government had earned through such duties. The independent Ceylon was expected to carry this forward by modernising and diversifying its exports in line with the changing global conditions. Yet, this did not happen, and even the economic reforms introduced in late 1977 was able to add only one new product – apparels – to the country’s list of exports. Thus, by the time the new Government was formed in August 2015, the crucial need of the day was to look at the country’s export sector from a new perspective. It was pronounced boldly in the first EPS of November 2015, second EPS of November 2016, economic strategy vision contained in Vision 2025 released in June 2017 and all the budget speeches presented by Ministers of Finance. Yet, no concrete action was taken to realise this goal. In this background, though belated, the present exercise by EDB is commendable. However, a strategy is just a dream, and if the country is to benefit from that dream, it has to be converted to reality. That is a cumbersome and long process, involving a number of crucial steps. First, the dream has to be developed into a national export plan, which should be an integral part of Sri Lanka’s national economic plan. Since the National Economic Council that functions under the chairmanship of the President is reported to have formulated such a national economic plan, care should be taken to ensure that the goals, processes and methods of both plans are consistent with each other. Second, the plan should come out with a number of programs involving the key sectors covered in NES. Each program should have its own targets, key performance indicators, a time bound action plan and the resource base to achieve goals. Third, each program should be split into a number of sub projects that should be assigned to different implementation units. It is this ground force that should deliver results to the nation. Therefore, these units should be provided with necessary resources – both financial and logistical – on the one hand and properly incentivised, monitored and directed on the other. The fourth process is the most crucial for attaining the goals of NES. That is to give political leadership to the implementation of NES at the national level. It involves coordination of work among different agencies, trouble-shooting and acquiring resources for the implementation of the national plan to be developed under NES. In South Korea, in its initial phase of the export drive, this role was played by President Park Chung-hee himself, under Korea’s Economic Planning Board or EPB, which was similar to Sri Lanka’s National Economic Council today. It practically met fortnightly and took measures to direct the policy and troubleshoot issues that the whole plan faced continuously. Since the leadership was given at the highest level of the Government, it had the benefit of support and collaboration by all the Governmental agencies involved. Exports will not happen automatically simply because a government body has made a pronouncement. To change the structure of exports of a country within a short period, it is necessary to disrupt the whole economy from top to bottom and across all the sectors. The government machineries which are usually moving at a snail’s pace should be accelerated to the maximum speed possible to provide support services. Labour markets, which are rigid and ruled by uncompromising trade unions, should be made flexible with respect to entry, exit, on the job training and new skill and talent acquisition. The biggest disruption to be effected to the labour market is the conversion from a seniority and fixed salary based system to merit and output-based system. Universities and research institutions should rollout new technologies – known as inventions – for commercial adoption by the private sector – known as innovations. Then, the system should make that knowledge available to all, a process known as diffusion so that other like-minded businessmen could imitate it and carry it further forward. This is a tedious long process but a must for sustained economic growth, according to Austrian-American economist Joseph Schumpeter who outlined it as far back as 1942 in his Capitalism, Socialism and Democracy. These new innovations destroy the old systems subjecting them to a beneficial outcome which Schumpeter called ‘creative destructions’. In fact, Schumpeter derived this destructive process of capitalist development from the preacher of antibody of capitalism, the legendary Karl Marx, who predicted that these internal destructions are the sources of the eventual destruction of capitalism. But Schumpeter viewed them as beneficial to society and contributory for continued sustained growth in capitalism-based economic systems, instead of being self-destructive. Since societies had learned to absorb the shocks delivered by creative destructions with a minimal damage to their membership, history has proven Schumpeter correct. The subsequent economic schools have taken Schumpeter further forward identifying the role of the new innovation processes in adding more output to an economy in a synergetic contribution now called ‘Total Factor Productivity’. Societies that abhor disruption love to do what they are doing in the same way which Schumpeter termed ‘perennial lull; but what is needed is a continuous forced change or a ‘perennial gale’. Thus, if Sri Lanka is to convert its lull-driven economy to a gale-forced disruptive force, it should have a leader in the form of a ‘game changer’, capable of managing opposition, seeing things in the correct perspective and driving its citizens forward with confidence toward realising predetermined goals. In South Korea, this leadership was provided by President Park. In Singapore, it was Prime Minister Lee Kuan Yew, supported by his Minister of Finance, Goh Keng Swee. South Korea chose heavy and chemical industries as the driving force, got its universities and higher learning institutions to rollout new inventions in collaboration with leading private enterprises, and established economic relationships with the Western world that ensured markets as well as foreign direct investments. In Singapore, Lee and company established a Western Oasis to facilitate experts from the Western world to feel like they are at home, deliberately adopted a Leap-frogging policy to maintain its economic relations with countries beyond its immediate neighbours, and switched over to English as the medium of instruction at schools and universities while forcing its universities to get affiliated with the best of the best universities in USA like, Harvard, MIT and Chicago. These policies paid dividends within a short period, and both South Korea and Singapore were able to elevate themselves to the rich country club within a single generation. 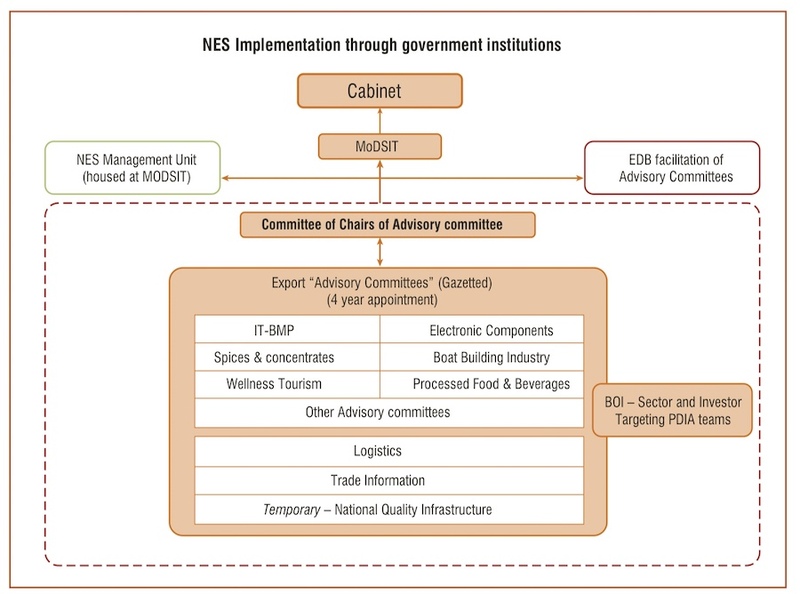 The implementation machinery of NES is a pure-authority based structure with the Cabinet of Ministers at the helm and Ministry of Domestic Strategies and International Trade functioning under it as group leader. The Ministry is supported by an NES Management Unit setup in the Ministry and EDB as a facilitator. Under them are a host of advisory committees, gazetted to provide legal backing, with the Board of Investment or BOI on the side-line to attract investments. Connected to this setup are several dozen Government institutions that have to implement the entire strategy, which should be converted to policies, plans, programs and projects. This is an authority based structure, because those at each level wait for the decisions coming from the top, and those in the top are in a position to annul any decision made at lower levels. That type of a machinery is good for a bureaucratic arrangement, which gives priority to rules rather than the need. It is not the fertile ground for creative thinking at all. Without creative thinking at all levels of implementation, a national level export strategy or for that matter any national economic strategy cannot be implemented. Furthermore, the relationship with the National Economic Council functioning under the President has not been clarified. It is likely that NES will work independently of the proposed National Economic Plan of the National Economic Council. Moreover, Sri Lanka is notorious for having an elephantine Cabinet which is pressed for time, wisdom and agility to make quick decisions. Because of the sheer largeness of the Cabinet, it is very rarely a decision is made on the very first submission of a Cabinet paper. Such a slow-moving creature cannot function as a game changer effectively in a world where the rules of the game is changing pretty past. This is specifically crucial for NES because it has chosen six key sectors as drivers of future exports of the country, and in the case of all these sectors, the rules of the game are changing pretty fast with new disruptive technologies being introduced. Thus, the game changer should be faster than the game-changing technologies involved. The European Foundation for the Improvement of Living and Working Conditions, known as Eurofound, has identified five major game-changing technologies in a 2018 report titled ‘Game Changing Technologies: Exploring the Impact on Production Processes and Work’. The Eurofound has warned the European countries that they should be in readiness to face the changes in manufacturing processes arising from the game-changers concerned. 1. Industrial Internet of Things, which would automate most of the industrial processes in addition to automating personal services. 2. Additive manufacturing, that will use both 3-D and 4-D print manufacturing for turning out almost the entire range of manufactured goods that are produced in the world. 3. Industrial robotics, which would replace floor workers in manufacturing plants and those foot soldiers in the services industry. 4. Electric vehicles, which would replace the present fuel-driven internal combustion engines with lighter and longer-life batteries and quick recharging systems. 5. Advanced biotechnology, which would produce almost anything ranging from new crops to human organs. Sri Lanka’s human game changers should be far faster than these physical game changers in the field to the rules as and when the new games are set for them by changing technologies in the world. For that, the whole of the Sri Lankan society and systems should be disrupted to pave way for a different future for the country. In the next part, we will look at the six focus sectors identified in NES. Are The Populations Of Bees & Butterflies Declining? Entrepreneurs who take risks want stability to ensure that they can get adequate returns for their investment. This Government brags about restoring democracy, human rights etc. Entrepreneurs in general do not care much for these things. From the day President Sirisena was elected, what prevailed in the country is instability. In my view, from an economic development point of view people made a big blunder by regime change. Despite some weaknesses Rajapakse Government brought peace and stability to the country. If President Rajapakse got elected, eight years of political stability was assured and that could have created a good environment for local as well as foreign investors to take bold decisions. Perhaps preventing that happening could have been one of the the motives of ‘Regime Change’. Hip Hip Hooray! for all your game changers for NES implementation. If there is a will there is a way! Do you see any way you can put the horse in front of the cart. In Singapore and South Korea there was and still there is strict rule of law for all those falling out of line. Lee Kwan Yew put a stop to communist violence through peaceful negotiation with China. The last South Korean President was promptly sent to jail for financial embezzlement. What similarity do you see in the thinking of the Sri Lankan leaders to the thinking of Singaporean and South Korean leaders? What happened to Vision 2025 of Bondscam Ranil?! The fact is that the Lankan economy is in depression and assets like land, labour and marine resources being sold off. This NES strategy will be implemented by the same Royal College Mafia that did the Bondscam at Central Bank led by Ranil and Ravi K who should have been impeached. They are in a rush to sell off and privatized Lanka which is already in a massive Debt trap and IMF’s “Bail Out Business” because of Fake Development. Plan or no plan we have to get the people to work. Number of holidays should be reduced. Unnecessary work stoppages should be curbeded. President JRJ took stern action against strikers while President MR used threats. Dr W A Wijewardena clearly believes in a ‘consumption’ based economy. The slogan “Export more to pay for increased imports” will appeal to the cake-eating elites but what about the sambol-on-bread eaters? MAjority of Sri lanka are PEasant Farmers. TO increase their income by two fold or ten fold, why do you need this much planning. Why do they always go to experts. Besides, Economists have not suceeded int he world amidst it is a big subject. Remember The eocnomist who developed his own idea and gave micro loans to Bangla deshi people got Nobel prize. On the other hand who implemented in Sri lanka amde Women in the north commit suicide and the progam is a failure. why. I think Ranil is slotha now because for some reason he accpeted to run the IMF/MCC economic program. Proably, Maithriopala for political reasons, the elelction cmoing, wants this NES. IT is all JOKES. Rajapskes and their group ,which is over 70. are salivating saying when to jump into the chicken coup.